How did a 37-year-old passer three years removed from neck surgery deliver a historic season and Super Bowl berth? Credit a subtle but essential offensive shift. The last time Peyton Manning competed for a starting quarterback job, he was a freshman at the University of Tennessee. The Volunteers had a couple of upperclassmen quarterbacks on the roster in 1994, but they also had another touted newcomer. “Branndon Stewart was recruited [to] Tennessee the same time I was,” Peyton wrote in Manning, the family memoir coauthored by Archie Manning. “It was still him against me for the job, and just the sight of him made me want to head to the weight room.” The 6-foot-3, 220-pound Stewart had set all kinds of Texas high school records and was a dual-threat quarterback similar to departed Vols veteran Heath Shuler, who’d just become a first-round draft pick. Manning knew that earning the starting job meant besting Stewart. While Manning has matured considerably since his freshman year,2 he’s as competitive now as he was 20 years ago. A 37-year-old passer three years removed from spinal-fusion surgery cannot pilot arguably the best offense in NFL history, break myriad single-season passing records, and lead his team to the Super Bowl without possessing an aching desire to be the best. There’s another reason Manning has managed to make this his best season despite diminishing physical skills, though. The most well-prepared quarterback in the game has long molded his offenses in his own image, including last year, when the Broncos turned around their season by going all in with Manning’s old Colts offense. This season, however, Manning got a little help from some new wrinkles. Manning entered the NFL with all the physical tools a team could want: He was 6-5 and 230 pounds, with exceptional footwork and a natural throwing motion. He became one of the greatest quarterbacks of all time, however, due largely to his work on the practice field and in the film room. The zany performance art Manning delivers before every snap — all the hand signals, code words, and gyrations — is the key to putting that knowledge to work. Because he’s in such control between plays, Manning has created a paradox: He often sees simpler and more basic looks than even the greenest rookie quarterback, which has allowed him to take a different approach from most NFL passers. For most of his career with the Indianapolis Colts, Manning ran one of the simplest, most concise playbooks in the NFL — and he destroyed teams with it. It worked because every member of the Colts mastered those few plays, and because Manning expertly toggled between them based on the defense he faced. When Manning signed with Denver before the 2012 season, a lot of talk centered on how he was going to run the Broncos’ offense instead of bringing his playbook with him. After a 2-3 start, however, the team junked that plan, and by the end of the season, Manning’s Denver offense looked essentially like his Indianapolis offense. And that return to the familiar worked: The Broncos ended the regular season on an 11-game winning streak. Manning and Gase’s offseason agenda centered on finding ways to run Manning’s favorite plays from a broader set of formations and alignments. Although the Broncos use basically the same personnel groupings as Manning’s Colts — typically three wide receivers, one running back, and one tight end or two wide receivers, one running back, and two tight ends — Denver often deploys these groupings differently. One of the Broncos’ favorite formations this season has been “Trips Closed,” which features three wide receivers split to one side and a tight end lined up to the other. Defensive coordinators hate this formation because it puts the offense’s passing strength to one side and its running strength to the other, thus forcing difficult decisions about where to place additional defenders. Against the Broncos in particular, the defense has to decide how to cover Eric Decker in the slot — should it move a cornerback over Decker, or stick to its base look and keep a corner backside? If the defense wants to play man-to-man with both Demaryius Thomas and Decker, both cornerbacks likely need to flip to that side, or else Decker will wind up on a linebacker or nickelback, a sure mismatch. Doing that, however, tells Manning that the defense is almost certainly in man-to-man coverage, and regardless, few teams like to put both corners on the same side. As a result, many teams — including San Diego in the above photo — automatically check to some sort of zone against this look, though the options there are limited as well, as few defenses enjoy playing Cover 2 against Trips. It’s all catnip to Manning, since each defensive decision gives him an opportunity to adjust and attack. In addition to frequently featuring formations that Manning rarely used in Indianapolis or in his first season with Denver, the 2013 Broncos move their skill players around within those looks. Some of that stems from an upgrade in talent, as Wes Welker joined the team in the offseason, Demaryius Thomas and Decker both improved, and Julius Thomas emerged as a star tight end. But much of it simply comes from Manning and Gase being increasingly creative within a still simple playbook. Julius Thomas, in particular, is versatile enough to line up as an outside receiver while Decker or Demaryius Thomas moves inside, forcing the defense to decide how it wants to match up. For example, Manning’s record-breaking 51st touchdown pass this season came out of an unusual set: Denver lined up in an “Empty Quads” formation, with four receivers split to Manning’s left and a single receiver to his right. 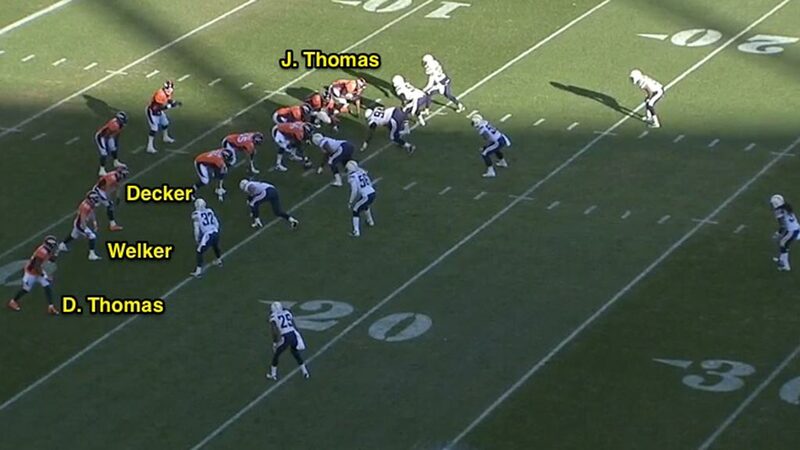 The outermost “receivers” on each side were running back Montee Ball and tight end Thomas. The play, four verticals, had Ball settling as a checkdown underneath. While that play is classic Manning, the formation and personnel alignment forced the Houston Texans into some hard choices, one of which was leaving linebacker Darryl Sharpton isolated on Julius Thomas; it didn’t take Manning long to identify or exploit that. The alternative to trying to fool Manning, and therefore risking being caught out of position, is to simply line up and play base defense. But unless a defense has better players than Denver — unlikely against an offense featuring five players who scored 10 or more touchdowns — that’s not a great answer, either. There’s no such thing as a defense without weaknesses, and Manning knows them all. Even though the actual plays in Manning’s current Denver playbook are largely the same ones he used in Indianapolis, the emphasis has shifted this season. With the Colts, a large percentage of Manning’s throws went to “vertical stem” routes, where receivers ran straight down the field before breaking inside, outside, to the post, to the corner, or curling up. Those throws are still heavily present in Denver — and no one has thrown a prettier fade pass this season than Manning; the above record-breaker to Julius Thomas is just one example — but a big chunk of Manning’s completions this season came on routes designed to be thrown short. The goal on such plays is to throw short and let Denver’s receivers run long, particularly with the “Drag” or shallow cross series. 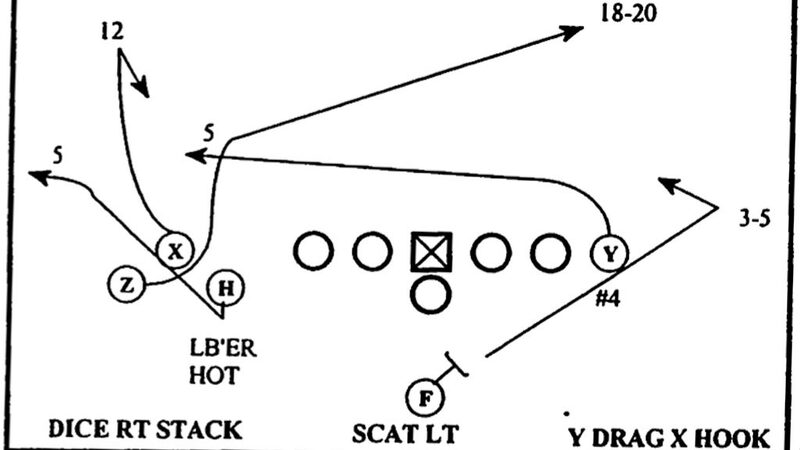 The diagram below comes from one of the Manning-era Indianapolis Colts playbooks. As the Drag series has taken on increased prominence in Denver’s offense, Manning and Gase have weaved in a number of variations, both by incorporating multiple crossers who run close together to create natural picks and by tagging individual routes to other base pass plays. Denver’s increased reliance on the Drag this season has been partially strategic, since it works well against the kind of press-man coverage many teams employ in lieu of letting Manning expose their zone coverage. It has also stemmed from physical concerns, though. Manning’s arm strength, while still serviceable, is obviously not what it once was. But, much as Michael Jordan shifted from slashing and dunking to employing a crafty and basically unstoppable fadeaway jumper as he aged, Manning has adapted to his physical limitations by relying on his anticipation, his ability to process defenses, and his knack for delivering accurate passes to receivers on the run. Belichick certainly didn’t like where his team ended up in an AFC title game loss to the Broncos, and as good as the Seahawks are, matching up with Manning’s third, fourth, and fifth options will be a real problem. It’s as good of an offense vs. defense Super Bowl matchup as we could have gotten. But for Manning, it’s also a vanishing opportunity. Twenty years removed from that freshman-year quarterback battle, Manning knows this could be his last shot at a championship. He’s chasing his second Super Bowl win, but he’s still competing like he’s fighting to start. Of course, he will face far more formidable foes than Branndon Stewart on Sunday. In addition to battling Seattle’s stellar defense, he will also very consciously be competing for an ineffable starting spot against all the ghosts of football’s past, against his peers, and against all the quarterbacks who’ve yet to even set foot on the field. The opportunity is there; thanks to Denver’s subtle offensive evolution, Manning might just be able to take it. Things worked out just fine for Helton. I assume he hasn’t locked Denver Broncos backup quarterback Brock Osweiler out of any meetings, though one never knows. Specifically, the outside receiver to the opposite side of the Drag runs a deep crossing route at a depth of 18 to 20 yards (unless there’s an additional “rub signal,” in which case he crosses at a depth of six yards to create a legal pick play for the Drag receiver); the running back runs an angle route or flat route depending on his side of the formation; and the other receivers run vertical go routes, although typically at least one of them is tagged with a specific route, such as Z Curl, Y Post, and so on.